Tape traps monitored on Tuesday, June 4 showed the start of crawler activity in the Hammonton area. Circled areas show freshly settled scales. 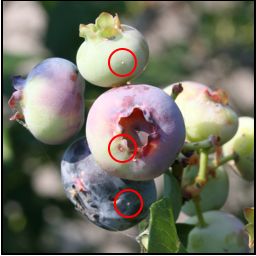 Scales feed on plant sap, decreasing plant vigor and fruit yield. Adult scales are protected from insecticide sprays by a waxy covering. These insects are common in older canes when not removed, and located mostly under loose bark. In New Jersey, the Putnam scale has two generations a year. It overwinters as second-instar nymphs under loose bark. Spring activity begins in early February. Eggs from the first generation are laid in late April, and immature “crawlers” typically begin to appear in mid-May. Peak crawler emergences occur in late May and early June (this time of the year). Peak crawler emergences for the second generation occur in early to mid-August. Growers who had a scale problem last year can treat the first generation crawler stage now with Esteem (35W or .86EC, 7 day PHI), or wait until peak crawler emergence and use Diazinon (7 day PHI). Diazinon can only be used once in-season, and waiting until peak crawler emergence may put you too close to harvest, at least with early varieties. The second generation can be treated later in early August. Crawlers can be monitored by wrapping black electricians’ tape covered by double-sided sticky tape around canes. Use a hand lens to see crawlers on the sticky tape.